We are proud to test negative for CAE/CLA. 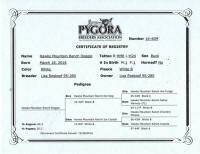 Welcome to Our Pygora Herd Sires page. 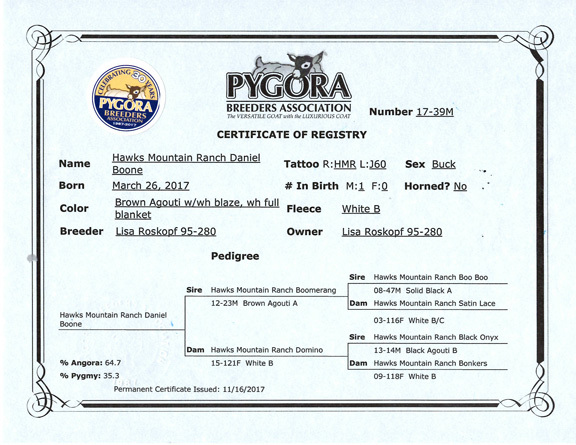 Every Fall, each buck is carefully selected for each doe with the intent to bring out the very best quality of Pygora kids the following Spring. 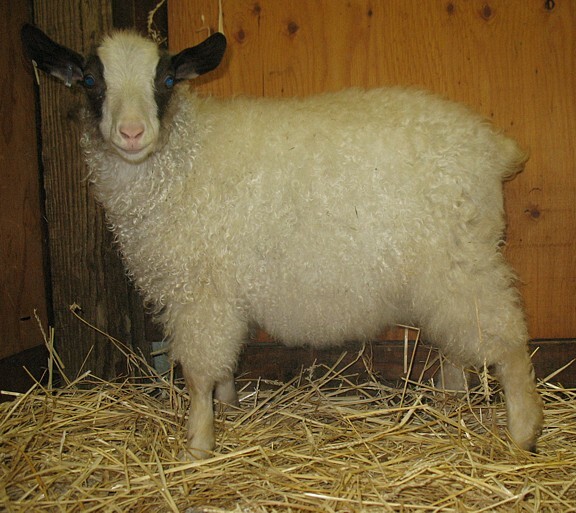 We offer a large variety of bloodlines, fleece types, and colors! All of our Pygora Bucks listed below are registered with the Pygora Breeders Association registry. 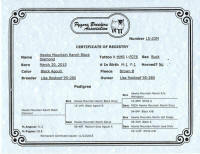 Each year we are looking for "that special buck" to add to our group of outstanding herd sires. Every year we select a few animals and use them on selected does. If we like what they throw, and the quality level is consistent, we then use them as replacement sires in our program. Andy's Legacy is a son of our late, "Andy" also known as "The Texan". 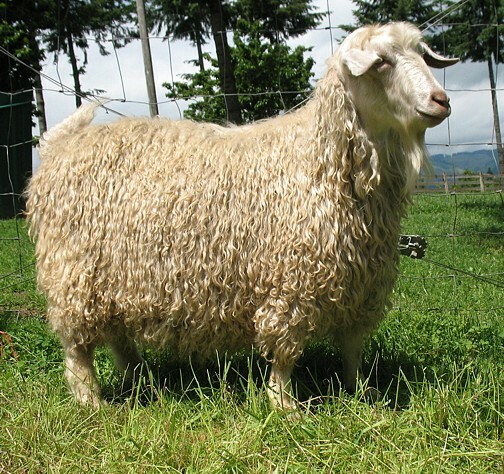 We have high hopes for him to add great fiber and conformation to his offspring. 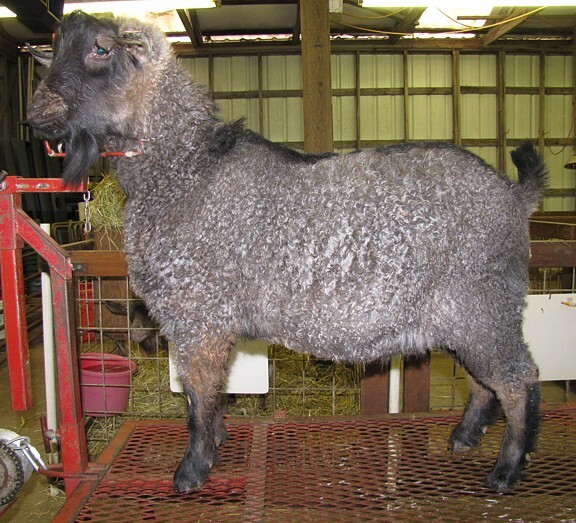 Black Bo's sire, HMR Black Chrome, is a brother to our permanent grand champion doe, HMR Fudge. 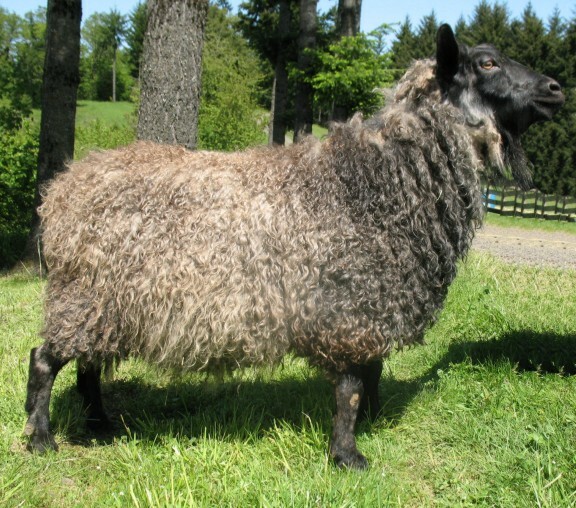 Black Bo has the most incredible fleece. 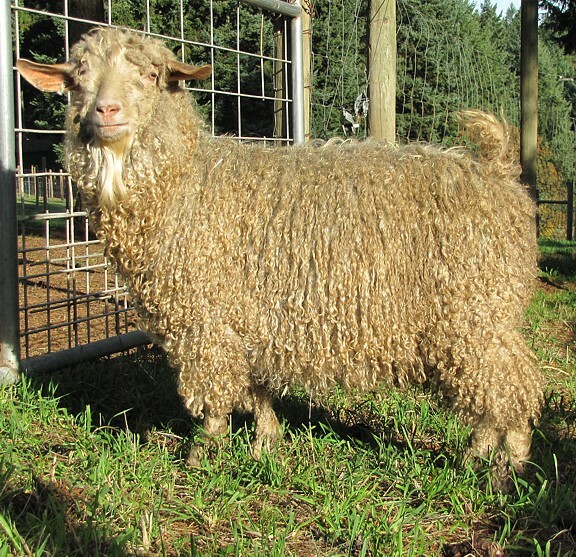 It is one big mass of tight locky ringlets covering his body. 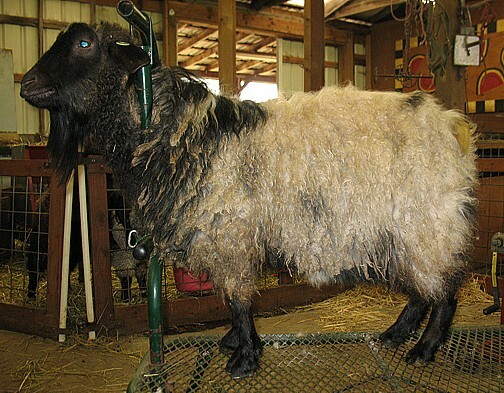 He has produced pffspring with some of our finest type A colored fleeces! 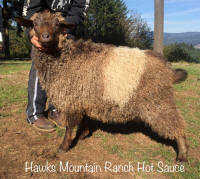 Our herd sire, "Charob's Miracle", has proven himself as one our more "colorful" bucks. 2009 was his 2nd year being used as one of our herd sires. 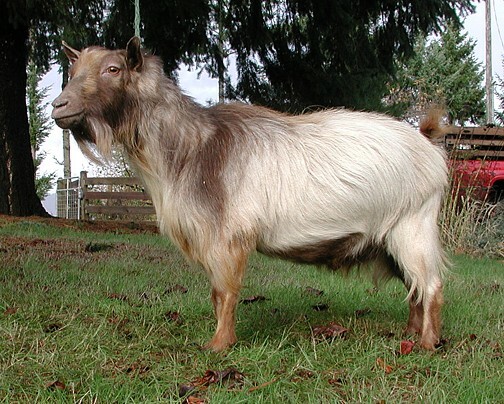 He has added stoutness as well as interesting color patterns in his offspring. Although Charob's Miracle is white, he is heterozygous white which means that he can throw color in his offspring as his dam was a brown Pygora. 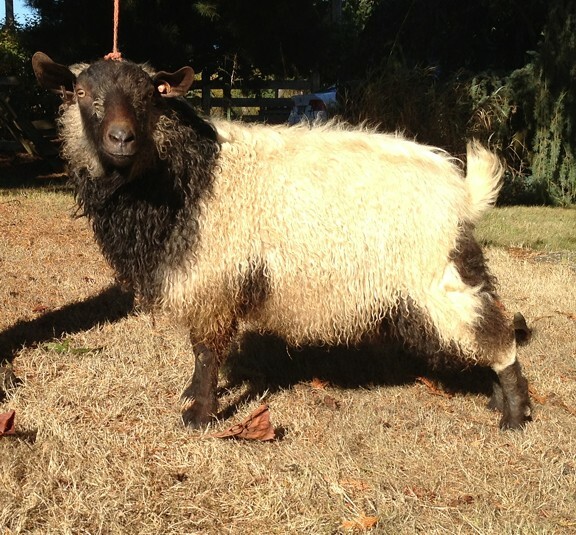 Charob's Miracle carries a hidden recessive color gene under his dominate white (absence of) color pattern. We have had some very striking babies from him. Black and white, grey and white, and Caramels and more. We look forward to our 2011 breeding/kidding season as pair him up with our does and expect another spectacular crop of babies in 2011. 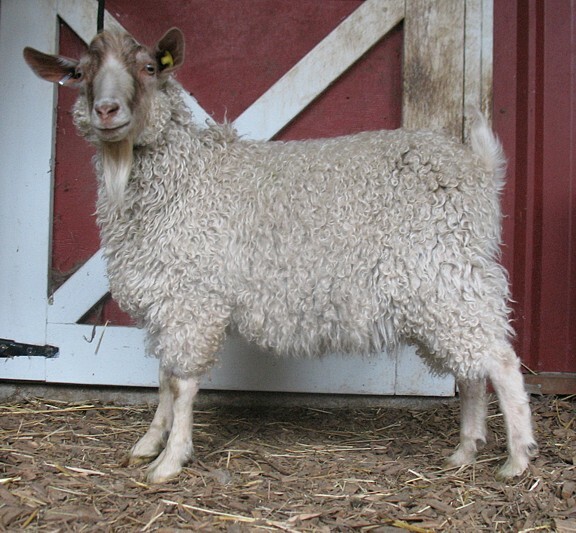 "Teddy" was a buckling his first year as a herd sire. He produced some beautiful type A fleeced kids. 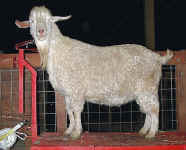 We are excited about having him in our Fall 2010 breeding program. He is very gentle with a playful personality. 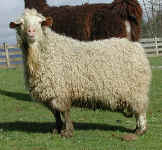 He has the most lustrous and fine type-A fleece with excellent fleece coverage from front to back. We can hardly wait to see his offspring. 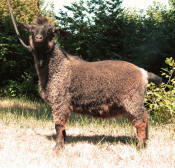 Hot Fudge is one of our top herd sires. 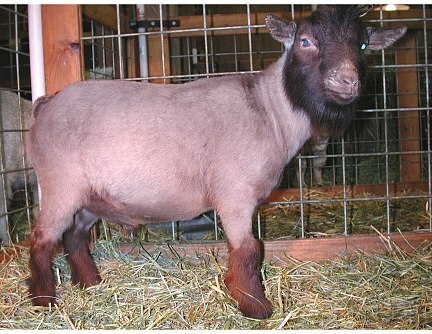 He is the son of our Permanent Grand Champion Doe, HMR Fudge. He has a very strong conformation, stout legs and broad chest. 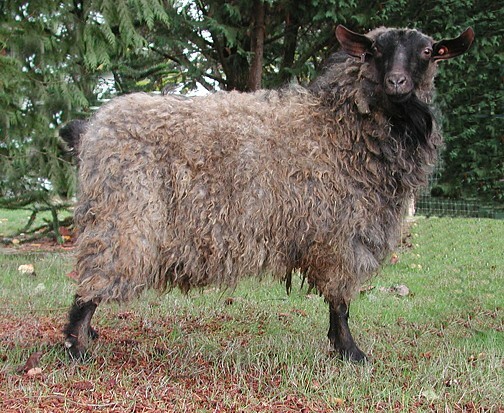 His wavy chocolate fleece is very consistent from front to back. 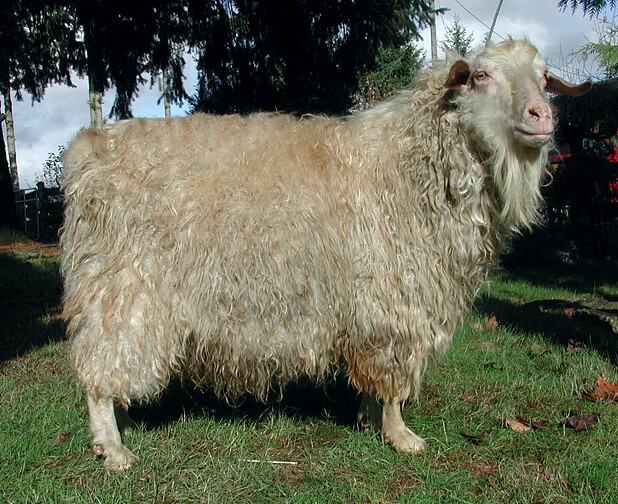 He tends to throw his great conformation and fleece into his offspring. "Hawks Mountain Ranch Hot Fudge"
"Hawks Mountain Ranch White Gold"
White Gold is one of our proven herd sires. 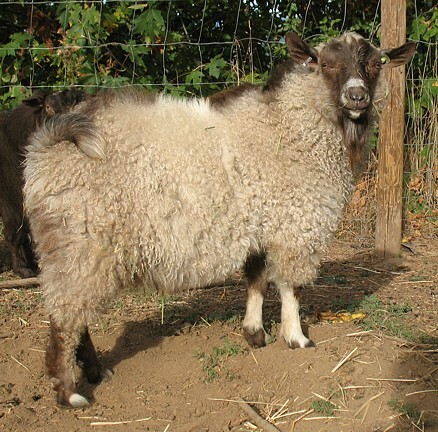 He has it all, great conformation, beautiful white ringlets of fleece and a gentle disposition. 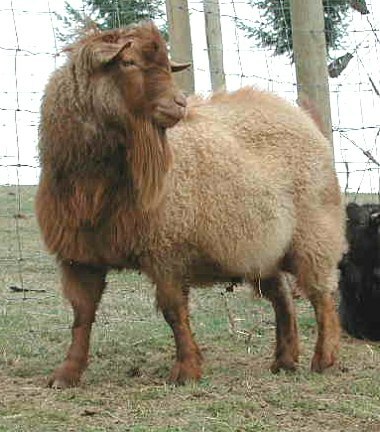 2003 was Chester's first year as a breeding buck. He is a very tall and broad chested buck and stands on very stout and strong legs at only 9 months of age in the photo. He is already as tall as some of our 2 year old bucks. 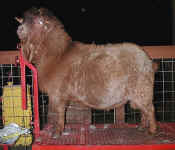 His base color is a very unique deep rusty brown with a caramel taffy colored fine undercoat. He threw beautiful brick red, auburn, and dark brown kids. He is a great addition to our breeding bucks. Black Chrome comes from champion fiber producing bloodlines. 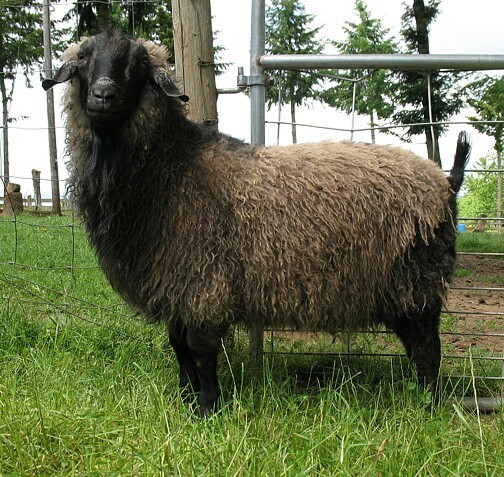 His deep silvery brown fleece is one of our best for fineness, silky long ringlets, and consistency from shoulder to back legs. 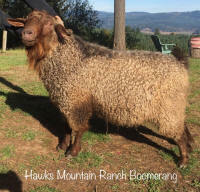 We brought this new outside bloodline in for our 2001 breeding season. 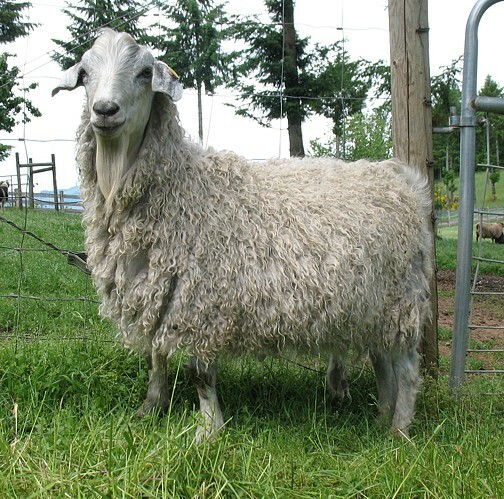 He has a traditional Type-A fleece with long flowing wavy locks that cover his whole body down to his knees. 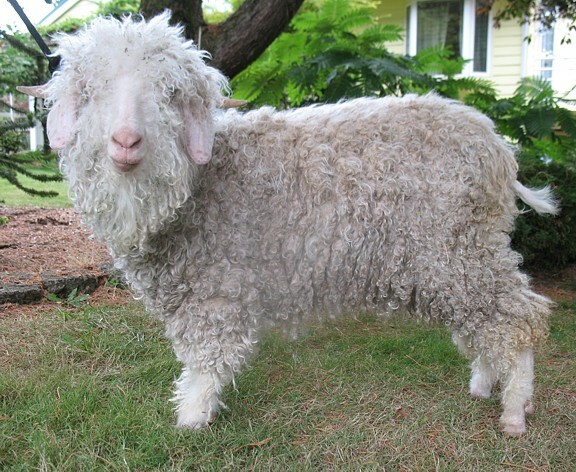 He also inherited some grease in the fiber that came from his Angora genetics. 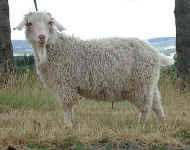 His sire is a registered Angora buck who was bred to a light blue Pygora doe. 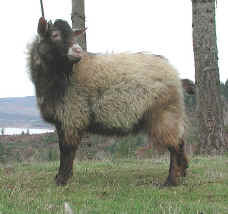 He carries color and has produced many Black type A offspring. 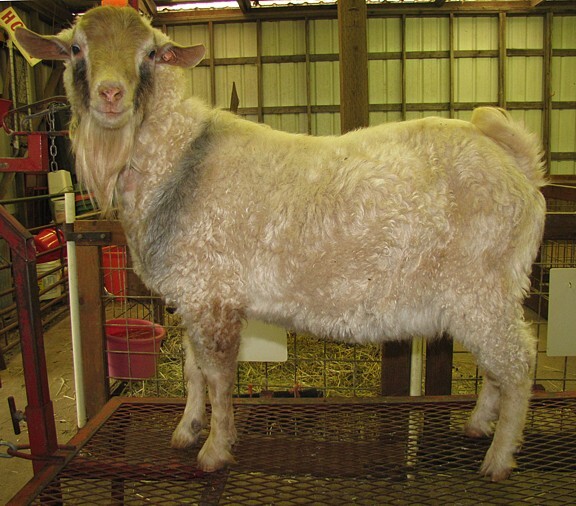 "Bo" grand dam is a 2X Grand Champion Pygora Doe, Tierre Madres Charlotte. 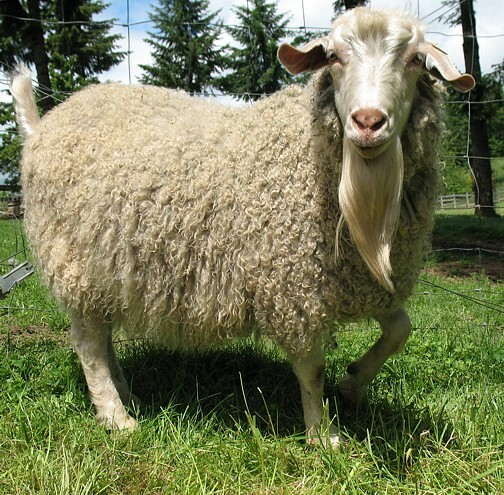 He has a very beautiful type A fleece with lots of ringlets of fiber from front to back. His dam is a black doe so Bo carries color and has produced colored offspring. Dam: PBA#: Fleece type: . 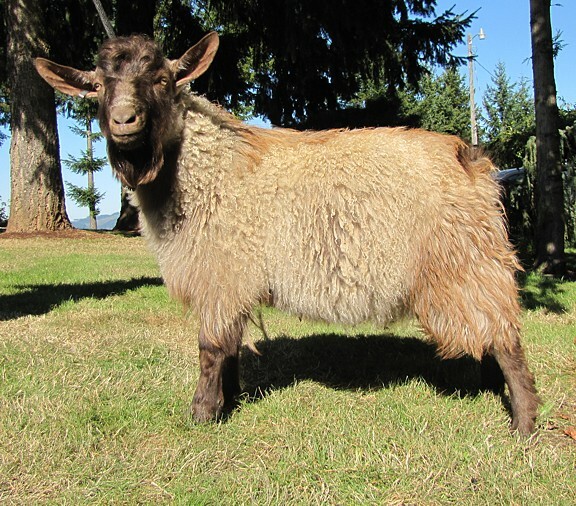 This caramel and black buck has served as one of the principle "color sources" in our herd. With his horns and ominous appearance, he may look intimidating to those that meet him for the first time. Underneath it all, he was a true gentleman towards his does and people alike. 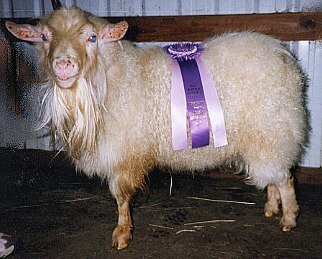 Eyore was the very first Pygora to have achieved the status of PBA permanent grand champion buck. He was a very stately buck and captured everyone's attention when they came visit the ranch. 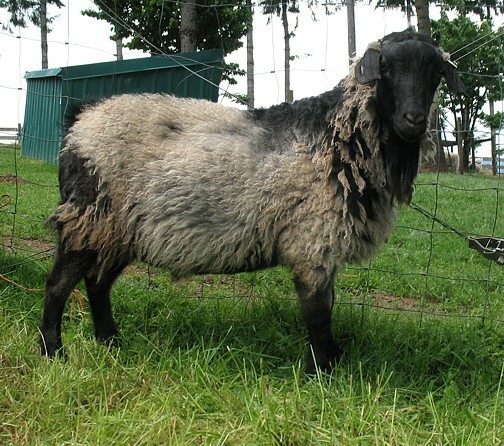 He has sired many offspring with the same conformation, fleece and presence about them. We are very proud to have had him as one of our herd sires. He will be missed. 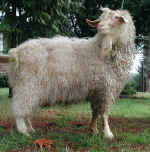 Rucksack was our biggest herd sire to date. This belted patterned buck has produced many offspring with this very unique color pattern combination. We used him to add size and structure in our breeding program. 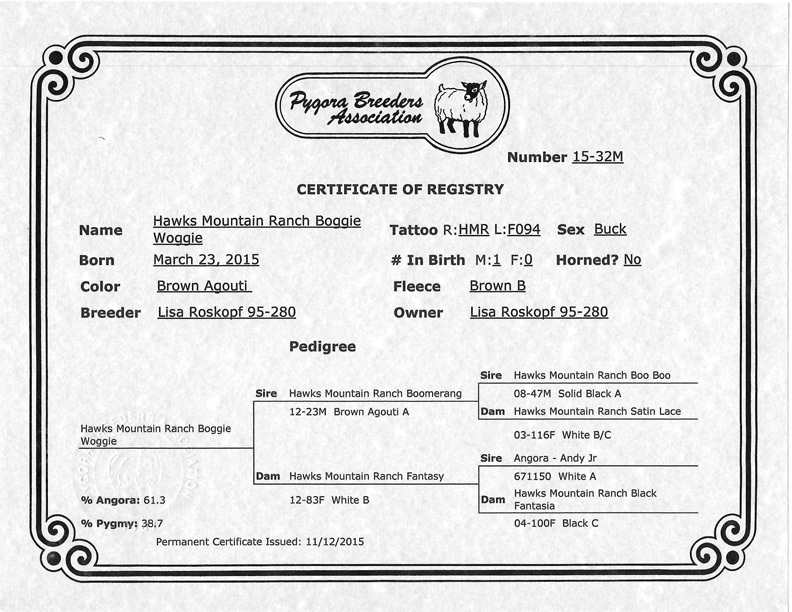 "Hawks Mountain Eyore's Grandsonny Boy"
A grandson of our honored herd sire, Eyore. He has a lively and inquisitive personality. He is "Carrot top red". 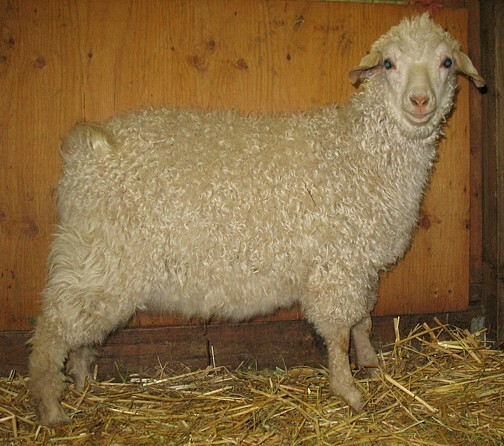 His fleece is a wonderful, fine strawberry blonde and is consistent in color and fleece type throughout his body. Dogwood brings in another bloodline to our herd. Not only does he have the dark color that we favor, he is a nice square buck with good solid legs and a strong top line. 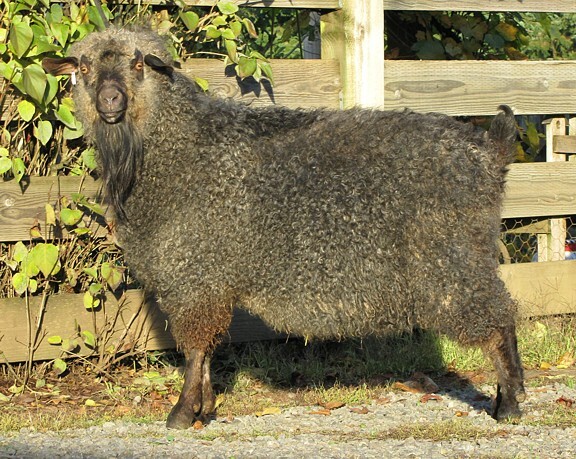 "Ketchup" is a very handsome brown Pygmy Buck. He is thick and beefy. A real power pack! Ketchup has a broad chest, nice straight legs and is full of energy! He knows what his job is and gets it done quickly. We expect lots of brown Pygoras the spring of 2005. 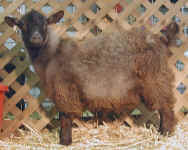 Ketchup carries the very recessive brown color and has produced many "true Brown" Pygoras for us over the last 2 years. 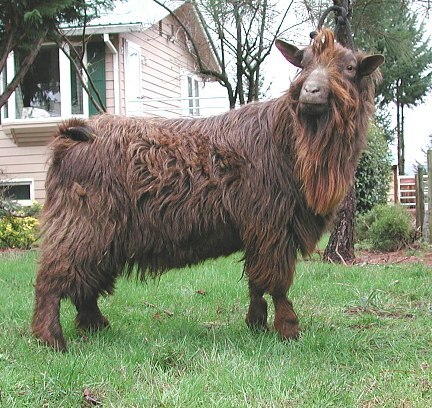 He has a very beautiful downy soft cashmere type fiber under his dark brown outer coat. 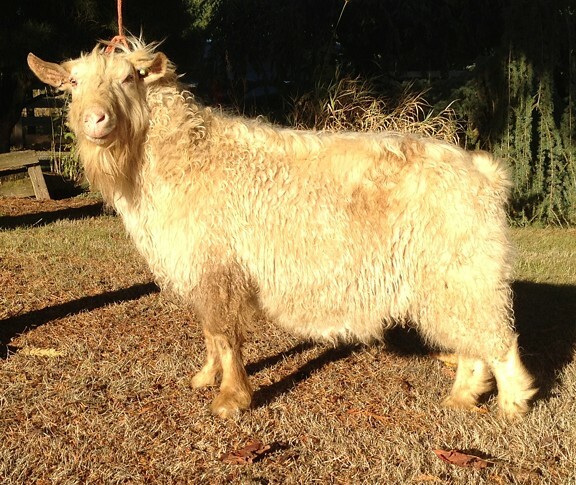 "Ketchup" is registered with the National Pygmy Goat Association (NPGA). 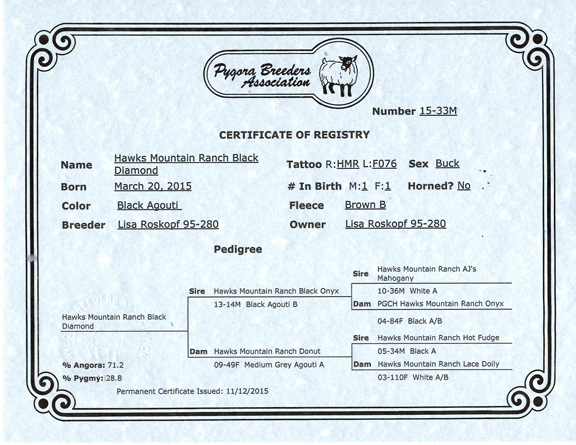 "Hawks Mountain Ranch Sargent Preston"
This is Sargent Preston's 2nd year as a breeding buck. 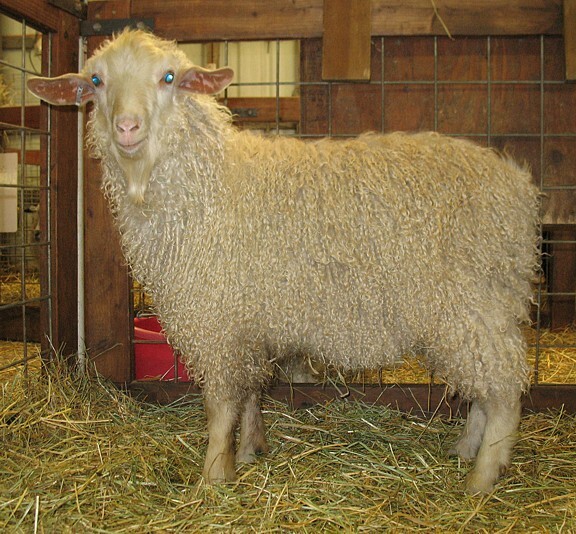 His sire is an AAGBA registered Angora buck who was bred to a brown caramel Pygora doe. 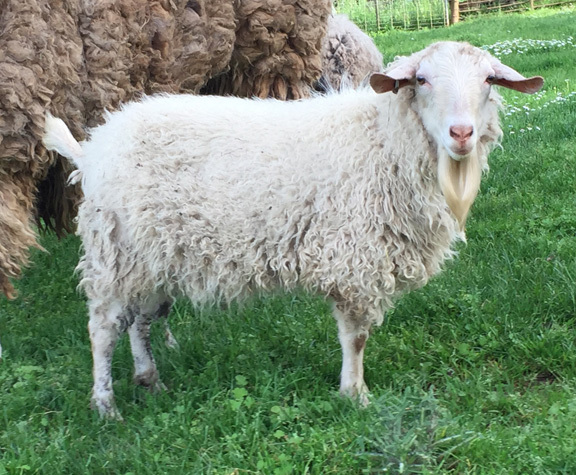 Now that the brown coloring has been injected into Sargent Preston's genetic makeup, along with the beautiful mohair fleece from his sire, we are looking forward to seeing the offspring he produces this coming kidding season. Spitfire is the sire to "Chester", one of our newest herd sires. 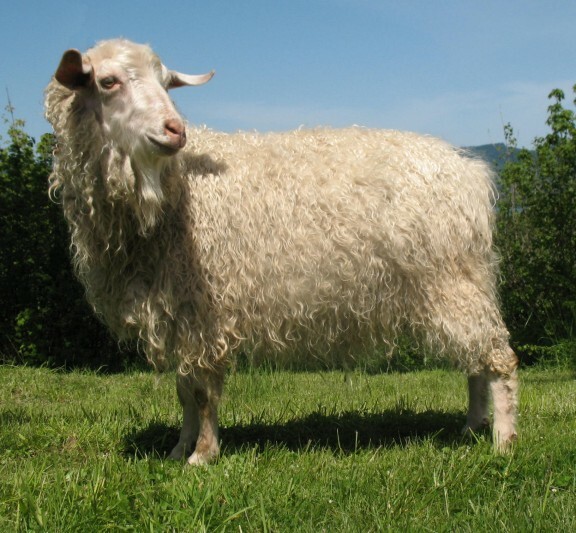 His auburn fleece is one of our best for fineness, crimp, and consistency from shoulder to back legs. 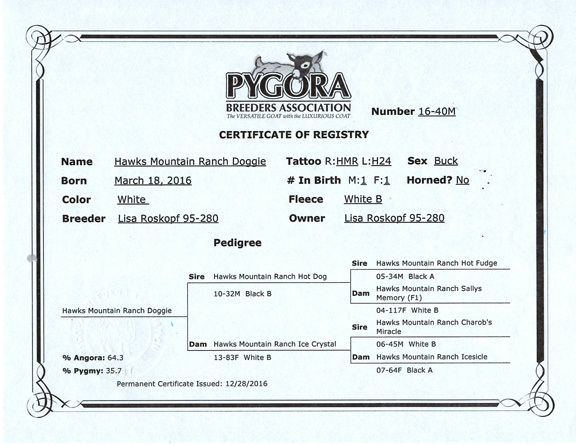 "Hawks Mountain Ranch White Lightening"
Whistler comes from our 2X Grand Champion Pygora Doe, HMR Sweet Cherry. We has a nice straight top line and great coverage of fleece from front to back. 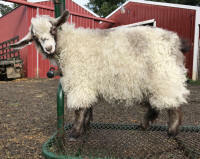 He throws some of our nicest type A fleece animals and lots of color too! He is a very mild mannered and gentle buck. His babies tend to have his same disposition. Duncan was a new addition to our farm last year. 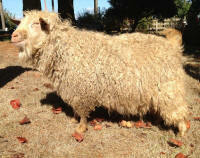 His outer coat is a deep Chestnut brown and his undercoat is a very fine creamy taupe cashmere-like fiber. He is a very gentle buck with a very mild disposition. We has been a great addition to our herd as he produced the most brown kids we have ever had. 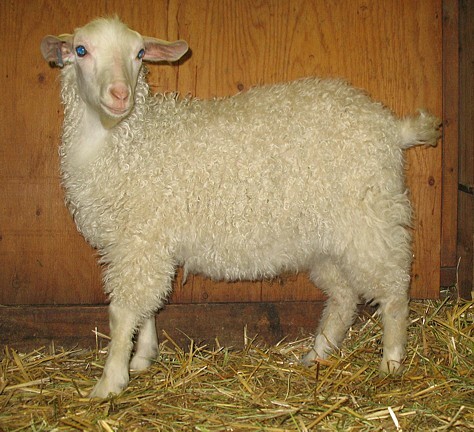 We are looking forward to seeing his kids come into fleece! This Angora Buck was brought in all the way from Texas summer of 2001. 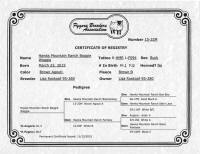 He was used on many of our Pygora does during our 2001 breeding season. This buck brings many strong qualities to strengthen our herd of Pygoras. They are: Large size, conformationally stout and strong build. Fine fleece characteristics with consistent fleece coverage, gentle disposition and a new bloodline to the Pygora breed. 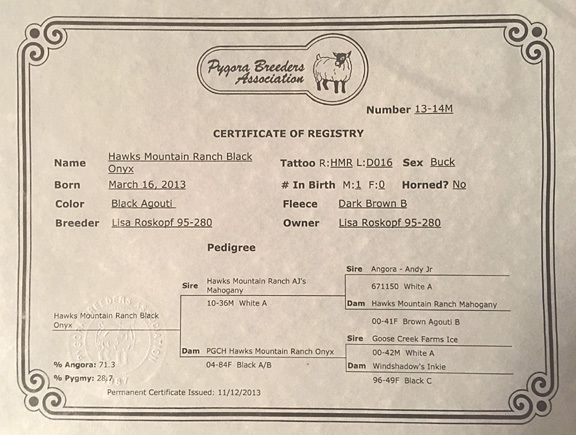 "Hawks Mountain Ranch Black Gold"
Black Gold is our newest addition to our breeding program. 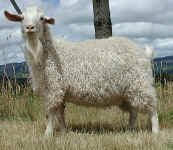 Both his white Dam and white Sire contain 75% Angora bloodlines. 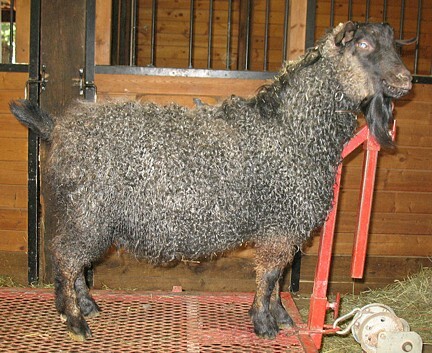 The Pygora bloodlines from each parent have helped produce Black Golds' wonderful dark silver type A/B fiber. 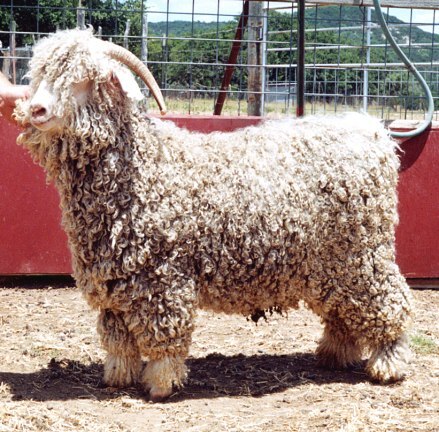 He comes from champion fiber producing bloodlines. 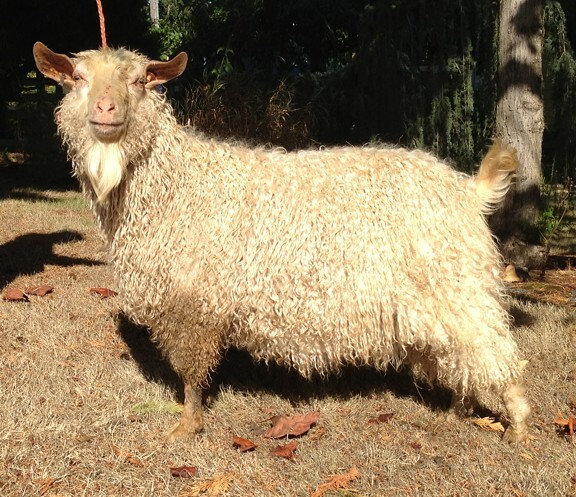 "Bulldozer" is registered with the National Pygmy Goat Association (NPGA). He is a stoutly built buck with a very interesting color pattern. 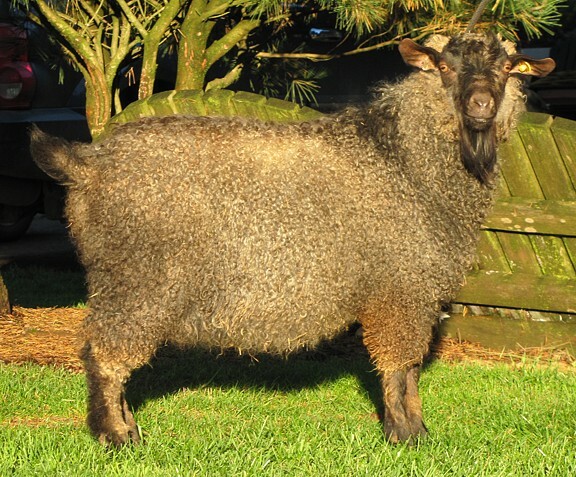 He carries the recessive brown gene and has produced some very beautiful solid brown offspring with a light brown downy soft fleece. Eyore's son has been one of our main herd sires because he carries the same stately frame and fleece characteristics of his father. He consistently throws that fleece type to his offspring. Although we are attached to him, we must let him go as he is related to many of our breeding does.. 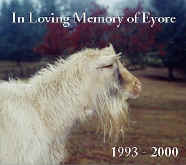 It is now time to let others enjoy the wonderful offspring that Eyore's son has to offer.